BERKLEY, MI--(Marketwire - April 12, 2010) - To mark the one-year anniversary of Westborn Market's Cherished™ store, located within the specialty grocer, the public is invited to a special "Meet Michigan" showcase of Michigan-made products on Friday, April 23, 2010. The event will be held from 1 p.m. to 6:30 p.m. at 27659 Woodward in Berkley. "We want to give our customers an opportunity to taste and experience a wide selection of Michigan-made products that offer great value," said Mark Anusbigian, president of the family-owned gourmet grocer. "We've partnered with more than a dozen vendors who will be providing free samples and demonstrations of their products." Koeze Company, a fourth generation family-owned business celebrating its 100th anniversary in Michigan, will showcase its 100% organic Sweet Ella's and all natural Cream-Nut peanut butter in a large exhibit that includes a vintage 1944 Oliver 60 Row Crop Tractor. "The tractor is reminiscent of our founder's farming background and the vintage peanut butter manufacturing machinery, mostly from the 40's, that is still in use today," said Martin J. Andree, Koeze's creative director. "Our success is based on preserving the traditional methods of classic food manufacturing that includes slow roasting small batches with superior ingredients." According to Andree, Sweet Ella's peanut butter is made from sea salt and 100% USDA certified organic Spanish peanuts grown in New Mexico. The all natural Cream-Nut peanut butter, produced since 1925, uses Virginia peanuts that are grown throughout the southeastern United States. All ingredients and packaging are made in the United States. Other companies scheduled to take part in the "Meet Michigan" showcase include Achatz Soups, Ambrosia Gourmet, Brownwood Farms, Faygo, Grandad's Sweet Tea, Hudsonville Ice Cream, Sanders, and YummyCubes™ Baby Food. Along with food products, Michigan-based pHurity, Inc. will display a wide variety of green cleaners, all made from natural plant-derived materials. The Environmental Protection Agency's Design for the Environment (U.S. EPA/DfE) has named pHurity as a formulator partner and recognized each of the pHurity® green cleaners and personal care products to carry the Design for the Environment label. pHurity representatives will be on hand to provide samples and answer questions about the cleaners, which range from free and clear and fresh lime laundry detergent to glass, multi purpose, heavy duty and all purpose concentrate dilutable cleaners. pHurity also manufactures a popular line of natural liquid and foaming hand wash cleaners, including hand wash refills. "We are very pleased to participate in this special event. Westborn Market has a recognized history of being a great supporter of Michigan-made products," said Barbara Kovach, pHurity co-founder and spokesperson. "My family is originally from Dearborn, so we grew up shopping at their store on Michigan Avenue." 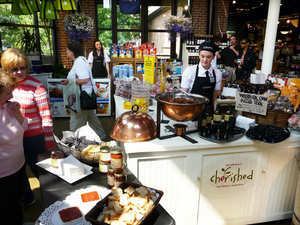 Visitors to the special "Meet Michigan" showcase, to be held within the unique conservatory of Westborn Market's Cherished™ store, will have the opportunity to experience many Michigan products. In addition, they will be eligible to win gift baskets, sporting event tickets and other fun prizes. Westborn Market has stores in Dearborn, Berkley and Livonia. Location information, hours of operations, online ordering and store specials are available at www.westbornmarket.com or by calling 248-547-1000. Visitors to the 2009 Grand Opening of Westborn Market's Cherished(TM) store in Berkley, Michigan.